A girl can never have too many red lipsticks and I'm no exception. 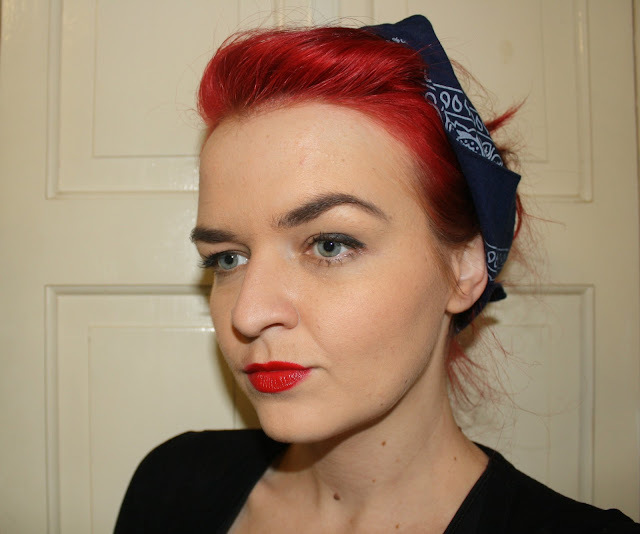 The latest member of my red lippie clan comes in the shape of this pin-up-perfect red from Smooch Cosmetics. Richly pigmented and vibrant with a glossy finish, *Rocking Red is one of those shades that I think would suit pretty much every skin tone. After a few hours of wear, the lipstick sort of stains the lips, leaving them looking lovely and 'bitten' but the gloss factor only sticks around for a short while. The formula is quite 'wet' so my only criticism of the lipstick is that it does tend to bleed and feather a little on my lips, though that's not really a deal breaker in my book. The packaging? Don't even get me started! This lippie is encased in the cutest, most kitschy tube I've seen in a while. Rocking Red (and 11 other gorgeous shades) are available for £7.50 from Smooch Cosmetics UK. Smooch Cosmetics are currently offering a free Glowing Bronzer worth £13.95 when you spend £15 or more so why not treat yourself to two lipsticks and get the bronzer free? Have you tried any products by Smooch Cosmetics?